A very warm welcome to Molly Campbell; thank you for joining us on BooksChatter! What was the inspiration for Crossing the Street? "I have always loved books about precocious children. Anne of Green Gables was a favorite childhood book, and I read this series over and over. I went so far as to name one of my daughters Anne! I have a very good friend who has a brilliant son named Bob. I was struck by their relationship, and when I began to write Crossing the Street,I knew that I wanted a character similar to my friend’s son. So I created Bob Bowers, a feisty little girl. Since I have never raised a son, I changed Bob’s gender so that I could more accurately portray the character! Crossing the Street is a story about one disillusioned writer, named Beck her eighty-four year old best friend Ella, and Ella’s seven year old great granddaughter, Bob. The book takes place during one very eventful summer when Bob’s arrival to stay with Ella starts a tumultuous series of events. As a former Erma Bombeck award winner, I write with a humorous slant. The book is both funny and tragic simultaneously." "As an author, I don’t think one can totally remove oneself from the process. Parts of me are in all of my characters. I also draw from my own life and family. However, no character is “copied” from life, as I would never want to alarm anybody into thinking they are featured in one of my novels! I love the character of Bob, and her ability to relate so well with adults, and I think that my friendship with an older neighbor when I was eight is certainly an inspiration for Bob and Ella’s closeness." The first thing that draws me to a book is its cover. Can you tell us about your cover for Crossing the Street - why you chose that concept and who the artist is. "I chose this photo because it so accurately portrays the storyline of the novel. Beck, who is not a fan of children, somehow gets herself inescapably entwined with two of them over one eventful summer. 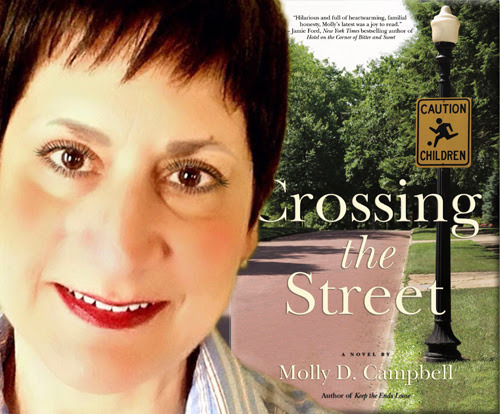 She “crosses the street” to Ella’s house and meets Bob, and she also “crosses the street into a whole new life.” The book takes place in a small Ohio town with streets that look just like this! I am thrilled with the cover." Why should we read Crossing the Street and what sets it apart from the rest? What makes your book unique? "This is a great question, and I will answer it without modesty! I am a combiner of truth with humor. My books are character-driven, and my characters are honest, quirky, and imperfect. The situations they find themselves in are unusual and sometimes hilarious. Crossing the Street is an easy and fun read, and I hope it contains some truths that will resonate with my readers." Good! That's what we like! Can you tell us something quirky about Crossing the Street, its story and characters? "First of all, there is a little girl named Bob. I also think that the BFF relationship between Beck and Ella is quirky: how many thirty-somethings have eighty four year old best friends? The book also has the sister from hell, a colicky baby, a totally perfect but incredibly boring boyfriend, and a surprise ending. Not the usual fare, right?" Who would you recommend Crossing the Street to and what should readers be aware of (any warnings or disclaimers)? "I write for women readers. Both of my novels (Keep the Ends Loose is my first) would also appeal to young adult female readers. I don’t consider myself a Romance author, although there is certainly some romance in both books. I resist the term “chicklit,” so I would recommend my book/s to any woman looking for an enjoyable and non-depressing reading experience!" If you could / wished to turn Crossing the Street into a movie, who would be your dream team? "These are such great questions! I would love Chris Columbus to direct the film. I would cast Maggie Smith as Ella, of course! Bob would be played by some totally unknown but engaging young actor. Beck would be, let’s see—Emma Stone. The boring boyfriend would be Jesse Eisenberg. The movie takes place in a fictional Ohio town, but Lebanon, Ohio would be a super location. If only there were a character in the book that fit Melissa McCarthy, I would cast her also!" "I like to write about family. I also love unusual people, and so I aim to populate my novels with them. In terms of genre, I am strictly conventional—I would love to write a mystery, but I could never puzzle-piece a plot together like that; plotting is my weakest attribute as a writer! It takes me two years to write a book. If I were to write a mystery, it would take decades!" "I am not disciplined. I cogitate about a story line for months before I am able to come up with one that makes sense to me. Then I write in fits and starts. I am not able to “sit down and write for two hours every day.” My writing sounds forced if I go beyond what inspires me at the moment. Then, with my brilliant editor, I may have to rewrite the book multiple times, as I did with Crossing the Street. I do, however, blog weekly on my own site www.mollydcampbell.com, as well as writing flash fiction for Literati Magazine on Medium." "I am brainstorming. So far, I know that my next novel will contain a person whose hobby is metal detecting. There will be a dog named Mushroom and a couple who are married, but the wife is heterosexual and the husband is gay. That is all I have so far! My brain is teeming with prospects!" And as a final quirky thing, to get to know you a little bit better... Tell me a little about your life? "I am a finger artist. 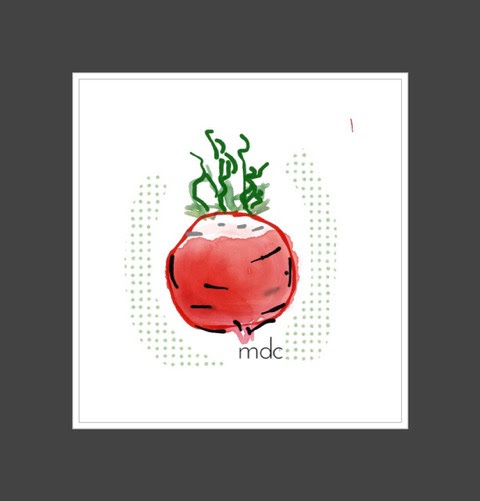 I illustrate my blog, and I also have a shop for my artwork www.cafepress.com/notexactlypicasso. I use an art app and draw on my iPhone screen with my finger! My husband is a professional accordionist, so that perhaps gives you an idea of my life as well! PS: I don’t attend his gigs! I am a cat lady, and I have four adorable cats. My daughter and I have rescued so many, we have lost count. I also do day care for my daughter’s adorable Pit Bull dog while she and her husband are at work. 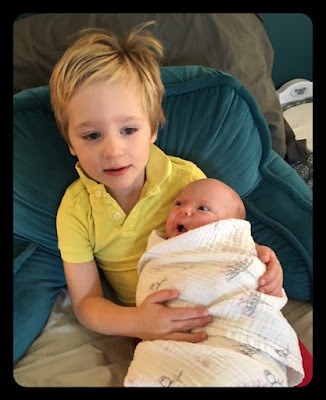 I have two adorable grandchildren that live in Los Angeles with my other daughter and her husband. They are way too far away from Dayton, Ohiol!" "THANKS SO MUCH FOR HAVING ME!" Great interview! I loved this book so learning more about it was so interesting. I too love this cover!